Marcus is a great cook. His pineapple ribs, pulled pork wraps, pancakes, and sweet potato burritos and to die for. Yet, when I travel for work I still like to make something that Marcus can pull out of the freezer and heat up for a quick meal. Between Pip the pup and his cycling training, I always feel like it would be nice for Marcus to enjoy something home-cooked without the fuss of actually cooking. Baked pasta like this is ideal; it’s delicious, full of flavour, and easy to bake up. It’s really not often that I travel for pleasure, without Marcus. I can’t think of a time before this, actually! My girlfriend, Gillian, and I are heading to Portland this Thursday for a girl’s long weekend. We are going to drink Oregon wine, eat Voodoo donuts, go to the market, walk around, and enjoy the Pacific northwest. My Dad worked as a high school teacher in Portland for a year, so I’d love to check out his old address as well. I can’t remember the year, but it must have been 1970-something that he lived there. Whether traveling for work or pleasure, the same rules apply and I usually make and freeze something for Marcus. I’ve made this recipe several times since I first saw it on Smitten Kitchen. Anything with sausage is a winner, and I like the ease of throwing it all together and feeding many mouths. The béchamel element is super easy and so much better than a jarred version. I love the crunch of the top, with the creaminess of the centre. This is a really tasty, really straightforward dish. I’ve even made it for company. Those closest to me will tell you I’m pretty (ok, annoyingly) organized and set in my routines. I like lists. I like checking things off said lists. Nothing pleases me more than snuggling in bed on a Saturday morning and making my meal plan for the following week, grocery list, and overall to-dos for both Saturday and Sunday. Heaven! Still, every once in a while, I forget a major grocery item at the store. Or I completely miss even writing it down, which frustrates me even more. Knowing I wanted to a) make this for Marcus and b) blog about it’s loveliness, I nearly gave up in discouragement when I realized I forgot to buy one of the star ingredients…broccoli rabe! You see, the original Smitten Kitchen calls for broccoli rabe in place of my version with frozen spinach. The broccoli rabe is tender, the tops loosen up and get lost in the sauce, and it’s all quite nice. When I realized I forgot to buy the broccoli rabe, a couple things crossed my mind. Substitute something else? I had carrots and zucchini in the fridge. Leave it out? As appealing as cheesy noodley sausage sounded, I knew I needed a green. And then, of course, I knew I would have a bag of frozen spinach in the freezer. Little did I know I had THREE opened bags of frozen spinach. Three! And different brands too. The stars aligned and I had my veg. Whether you opt for Smitten Kitchen’s broccoli rabe, or my frozen spinach, any hearty green will do just fine in here. Broccoli rabe could be just normal broccoli, or asparagus, leeks, brussels sprouts…I could go on. The size and shape of pasta matters not. I like something chunkier so the bits of sausage, green, and sauce can makes it’s way in all the crevices, but in a pinch use what you have. Along with Lisa Ling and Lena Dunham and Barbara Walters and Beyonce and Nora Ephron, I have a major woman crush on Deb Perelman. Deb’s Smitten Kitchen was the first food blog I ever found and loved. Her writing spoke to me: she was funny, she was normal, hey – I could be her, right? Many, many favourite meals of Marcus and I have come from Deb, and I keep going back (ok, daily) to see what Deb is up to next and to enjoy tried favourites. She is, simply, the best. This recipe from her is no exception. Marcus was away this weekend, so while I was getting ready for my imminent trip, I was also solo for dinners. Instead of the traditional baking in a 9×13 dish (which totally works well), I used a mish mash of dishes I had around. I particularly like a little glass Anchor dish that’s perfect for the single lady. The rest of the prepared dishes went straight into the freezer for another time. Spinach, it turns out, was fantastic. 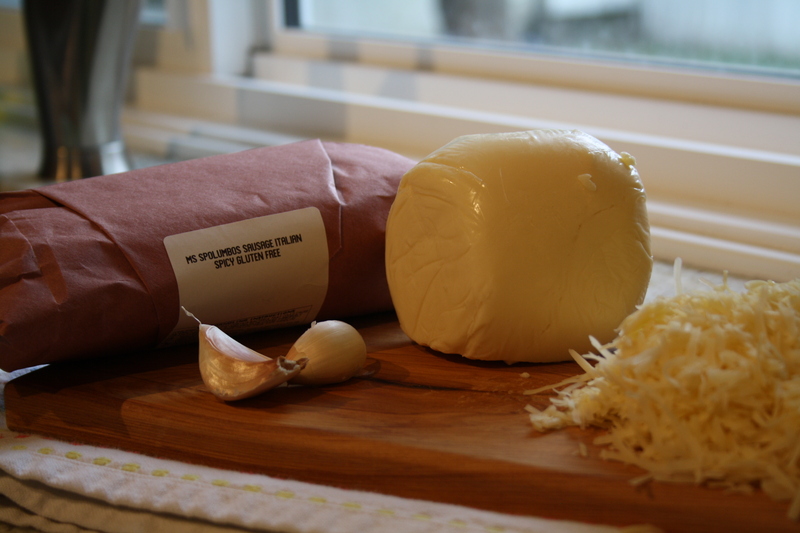 Although it would be hard not to be with cheesy, Spolumbos sausage in the mix. Either way, with a salad or veg on the side, this makes the ultimate make ahead meal. Marcus thinks so too. Add salt to a large pot of water and bring to a boil. Add pasta and several minutes before the pasta cooking time is up add the frozen spinach, right into the water. While your pasta and spinach is boiling, dice the mozzarella and grate the parmesan, then set aside. Drain the pasta and spinach and dump in a large bowl. 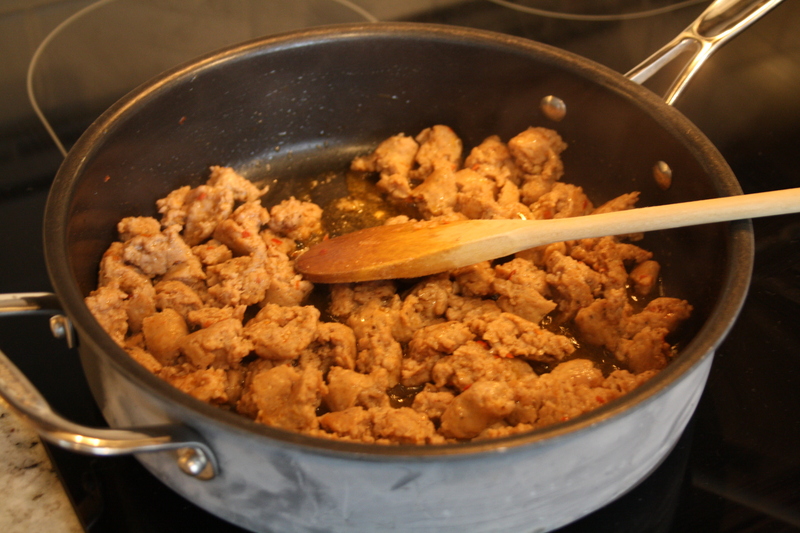 In a large frying pan, add the sausage over medium heat. Using a wooden spoon, break up the sausage as it cooks through and browns, about 8 minutes. Remove with a slotted spoon (or fish spatula) and add to your large bowl with the pasta and spinach. Leave the excess fat in the pan. Make your béchamel: Melt the butter in the same pan you cooked your sausage, over medium heat. Once melted, add the flour and whisk until smooth. Whisk constantly for 2 minutes. Pour a little amount of the milk, whisking constantly into the butter-flour mixture. Once fully incorporated, add a little more milk repeating the whisking until smooth. Add the rest of the milk and keep whisking until smooth. Add the salt, pepper, garlic, and nutmeg and keep stirring until the mixture bubbles and thickens to a saucy-texture. 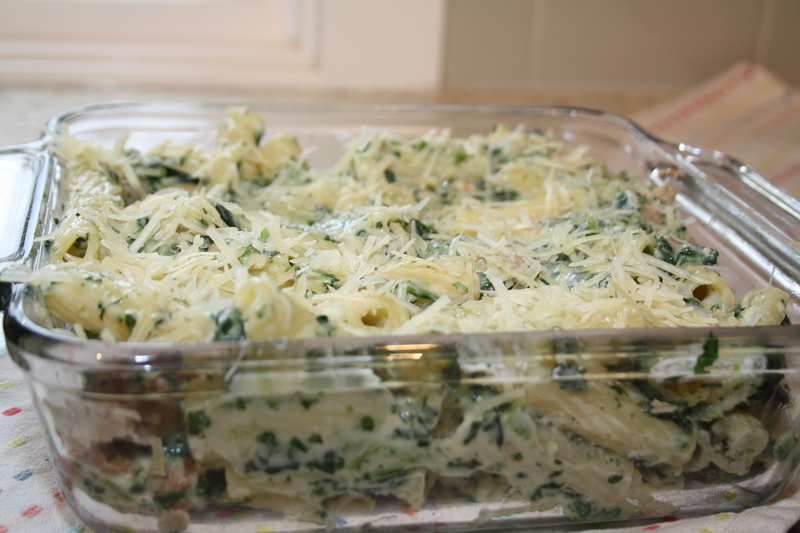 Add the béchamel with the pasta, spinach and sausage. Stir in the mozzarella and half of the grated parmesan. 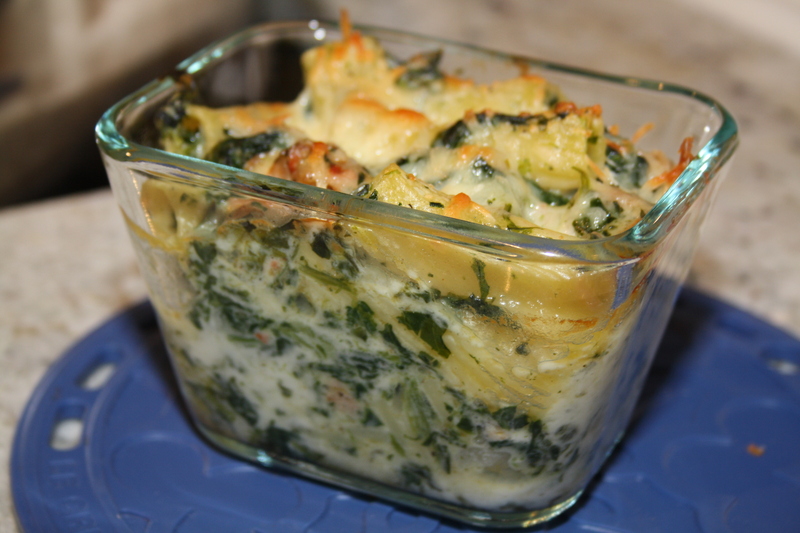 Depending on the use, pour the mixture into any sized baking dish and top with the remaining parmesan. A 9×13 inch baking dish will take all of the mixture, or you can use a 9×9 and a few smaller dishes depending on when and who will be eating the pasta. Bake for 25 minutes until browned.